Think you know all there is to know about Spider-Man? Are you considering all the factors at play? Are you considering the What If? For example, what if Flash Thompson became Spider-Man? Do you think the outcomes would be the same or do you think things would be different? 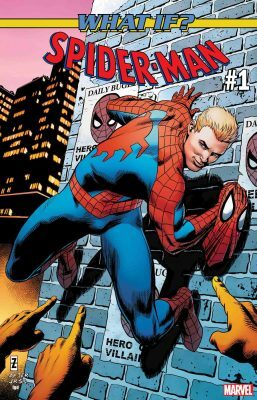 What kind of Spider-Man would Flash Thompson be? Would he be the hero those could look up to? Would he hold the same regard for responsibility as Parker does? Or most importantly would he have what it takes to save people? Have no fear, for all your answers will be answered. By a very reliable source to boot. As most of you know What If? was a series that showcased alternate versions of popular story lines and scenarios. What you might not of known is that this series is back. Marvel is releasing a number of What If? one-shots intent on asking the hard questions. To start things off they are exploring the concept of Flash Thomson becoming Spider-Man instead of Peter Parker. This story is a very intriguing look at what could have been. It’s makes for a very enjoyable read, and takes the reader down a fairly dark path. You have to remember this isn’t the War Hero Flash whom one day dawns the Venom Symbiote. This is the Football star bully we once loved to hate. As you can imagine things don’t go quite the same way they did for Parker. Gerry Conway(Werewolf By Night) spins together an exciting yarn full of action, heartache, and redemption. He manages to fit a strong compelling story in to one measly issue, which is definitely a feat to be proud of. This adventures captures the spirt of early spidey adventures while still bringing some new stuff to the table. The story is matched nicely with exceptional art by Diego Olortegui (She-Hulk). His style is also reminiscent of the Spider-Man tales of old. He has some really great page layouts that add some flavour to the book. Plus I really his suit design. It’s wicked awesome, and I wish it was unlockable in the new game.